There are a number of algae living in our fresh water and all are chlorophyll-bearing, aquatic organisms of simple organisation, either single-celled or multi-cellular. However none are as dangerous as the blue-green algae which is now considered to be a photosynthesising bacteria rather than a true algae. Blue-green algae occur naturally in fresh water throughout the world but only become a problem when present in extreme numbers, forming what is called a 'bloom'. Unfortunately a major problem for the management of Victoria's water resources is the frequent occurrence of blue-green algal blooms in some waters. An algal bloom is triggered by a high level of nutrients, particularly nitrogen and phosphorus. Major problems associated with blue-green algal blooms are the production and release of toxins, the discolouring of water resulting in foul tastes and odours and accumulations of surface scums. What are the dangers of blue-green algae? The decay of the algal bloom also results in a loss of dissolved oxygen in the water causing the death of fish and other aquatic biota due to lack of oxygen. Some species of blue-green algae have special characteristics that allow them to grow and multiply faster than other types of algae. For example some are able to use nitrogen from air as well as water. Some can use sunlight more efficiently than most algae, and other varieties contain pockets of gas that allow them to float to the surface and out-compete algae for sunlight. 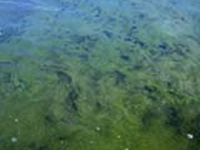 Anglers need to be aware of the dangers of fishing in waters where a blue-green algal bloom is occurring. The water itself can be toxic if swallowed or cause rashes and itchiness to the skin if splashed on the body. When the algae die and decompose they can release toxins into the water. These toxins can be neurotoxins (affecting the nervous and respiratory systems), hepatotoxins (affecting the liver) or toxins which can irritate or inflame the skin. If contaminated water is swallowed the cells can break down in the stomach and the toxins can enter the intestinal lumen. In time they reach the liver and cause the death of the parenchymal liver cells. This can be fatal. There are no known antidotes for blue-green algae toxins once a lethal dose has been ingested. Most conventional treatments and disinfection afforded most public drinking water supplies are not effective in removing or deactivating the toxins. Boiling is similarly ineffective. You might still catch fish in a contaminated water but they may taste muddy or earthy. The flesh can be eaten but the liver and gut are poisonous. For this reason people should not eat mussels or other shellfish collected from water affected by blue-green algae. What can be done about blue-green algae? A reduction in nutrients entering the water, particularly phosphorus, is considered to be the best means for long-term control of these algal blooms. A number of initiatives are underway to reduce the input of nutrients into our waterways. However other factors such as rainfall and runoff, the colour and turbidity of the water, water temperature, the shape of the waterbody and in a river, the flow rate, all affect the likely-hood of a blue-green algal bloom occurring. The frequency of blue-green algal blooms indicates that the natural ecological balance of many of our waters has been altered by undesirable management practices. It will take sometime to restore this balance. For further information and warnings see Blue-green algae and irrigation water.